I treat people in the comfort of their own homes. I travel around on foot with my trolley, which carries my instruments and equipment. I cover all of Lewes and also come out to Ringmer on the 28 bus. 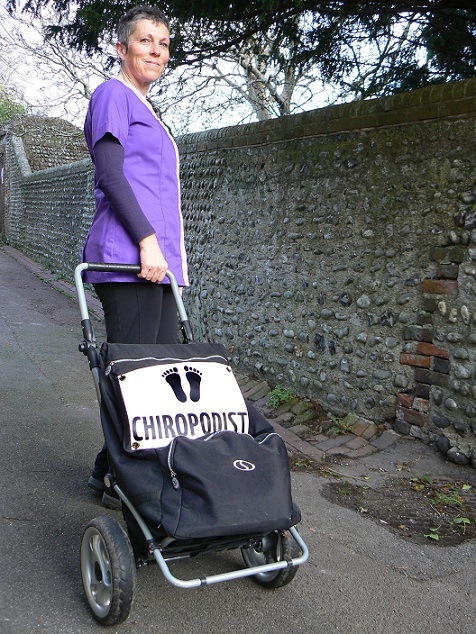 I have been a chiropodist for over twenty years and am registered with the Health & Care Professions Council (HCPC). They’re an independent regulator set up for the patient’s benefit. People have problems with their feet for many different reasons. Often it’s inappropriate or badly-fitting footwear. Some have underlying health issues that affect their feet, such as poor circulation or diabetes. Others may have back problems or knee problems and can’t physically reach their feet any more. And if your eyesight isn’t good, you could cut yourself instead of your toenails. Neglecting your feet is the worst thing you can do to them. They can change shape and size all the way through your life. So when you buy shoes, it’s best if you get them fitted professionally. Try not to wear the same pair of shoes for two days in a row. Your feet sweat, even though you’re not aware of it, and the shoes will pick up that perspiration. They need time to dry out and go back to their normal shape. I love it when my patients tell me how comfortable their feet feel after I’ve completed my treatment. When they’re happy, I’m happy.